Stoodin is online herpes dating site catering to singles living with herpes virus who want to hook up with other herpes singles that are ready to mingle. The website provides fun and user-friendly search & match feature that create a good chance for you to make friends, find love and support. No costs. Stoodin is one of outstanding and 100% free herpes singles dating site. You don't need to worry any monthly fees and years fees, and you will join a judgment-free, health-conscious dating community that is filled with like-minded and available singles to share your experience. My dashboard page has reasonable and concise layout. Here are a few available features that users can quickly complete profile, upload photo, search interesting people, find my match and my games. It makes page simple and easy to use. Users can easily find protential partner. Search features is simple and friendly. The website offers quick search, username search and advanced search. It can meet users' different search requirment. The website allows users to use search features before signing up. what counts is the search result page will show users lists that sort by latest activity, recently joined match, compatibility distance. It can help users saves many time to find an ideal match. Question feature increase strongly interactive. Ask and answer questions is the most obvious feature of the website. A friendly way to help users to deal with puzzled and share the experince. You don't need to worried any potential embarrass. You can search and browse all question or only friends's question, you can also ask a question and invite other members to answer or poll. Provide games download. The website is not only dating coomunity, but also social networking. It can provide plenty of games to help Herpes members find fun. You can search latest games, featured games or top rated game, and download the suitable for you. You can also invite herpes friends to play. IOS app is too simple and update slow. stoodin app is established in 2016, it is new dating application that serive for herpes singles meet up for love.But the app does not update anything. It always show" no message, No visitors", and there is many bugs, such as users can't log in from outside of the app. Too little active users. The wesbite only shows the join date of users so that you can be hard to make sure who are active members. You might spend too much time waiting for someone's messages. that is rather uninteresting. Although it is free dating community, overall herpes numbers of the website is not much, it is always easily to find active users in your areas. No quite enough care about user experince and health. The website only emphasize individual status but ingore members' dating experince and health. the website don't provide any dating tips and herpes treatmemt method to promote members find a successful date and herpes cure. Users need to bear entirely risk. The terms and conditions of the website clearly point out that user's use of any information and material is entirely at their own risk. Users should fully consider the pros and cons before signing up. 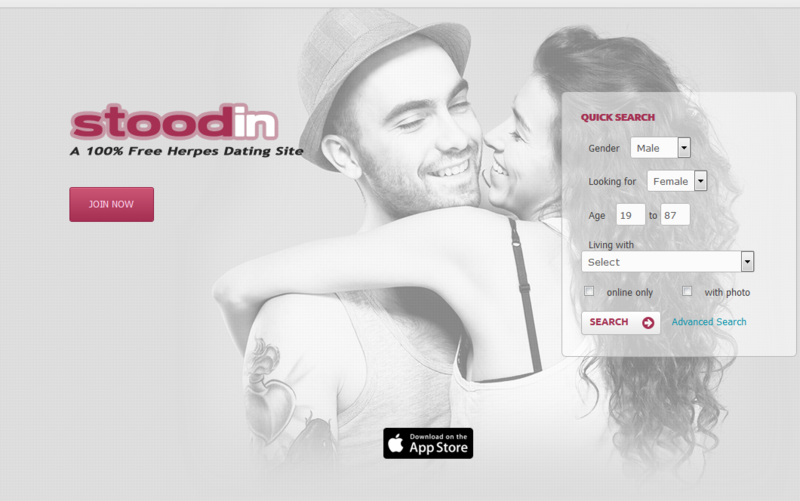 Stoodin is fast growing herpes dating site that caters to people with herpes to seek love, friendship, support and dates. It was established in 2015 and has about 80,000 members. it's an free herpes dating website and all profile need to be approved by administrator before interacting with other members. The website offers 100% free and friendly dating platform that anyone can join and find herpes dating without fear of feeling. In addition, the website lists lots of terms and conditions, all members must agree before joining. what counts is the website allows users search interesting HSV singles before signing up. Stoodin offers a safe, healthy, caring and enthusiastic dating platform that Herpes singles can searching for the unique support, friendship and love with a totally free from discriminatory judgment environment. It is easy register a member, you can chose valid email or connect with facebook account, and then finish required profile questions about your basic imformation, appearance and lifestyle. You don't need to wait for your profile approve and you can enjoy full access. The site interface is clean and attractive. user-friendly and easy to navigate, you can easily to use the website to search out interesting people who has herpes. In addition, the site provides clean “My Dashboard” feature that is quite attractive and easily use. Stoodin provides unique match system that membership can easily browse my match list. You can choose to browse the latest match, and you can also check top match. This is interesting match preference features that herpes members can easily find soul mate by special hobby. The website provide one way of contact that users can send messages to admin. This is just a form and most of users complain and feedback can't get effective help in time. The website allows users to register personal imformation anonymously, but the website is not responsible for personal information divulge on account of herpes members' individual behavior. Stoodin is a great herpes dating site that provide free dating service for herpes singles to find love and support. A new and growing herpes dating site that help HSV singles find an ideal match. Although many features of the website and service are not enough fine, it is still one of the most popular dating website for people with herpes to meet up for love.